​The Twin Cities Ukulele Club is a group devoted to playing and singing ukulele songs and tunes at UkeAmericana, Wednesday Noon, Friday Morning, and BUG jams, or sing-alongs, each month. We also conduct BUZZ and MPtB group lessons for an instructor fee. Our jams are Music Tours geared for adult and teen beginners to advanced uke players, with an emphasis on keeping things simple so all can participate right from the beginning. The Twin Cities Ukulele Club jams are open to the public, and there is no required charge for the jams. 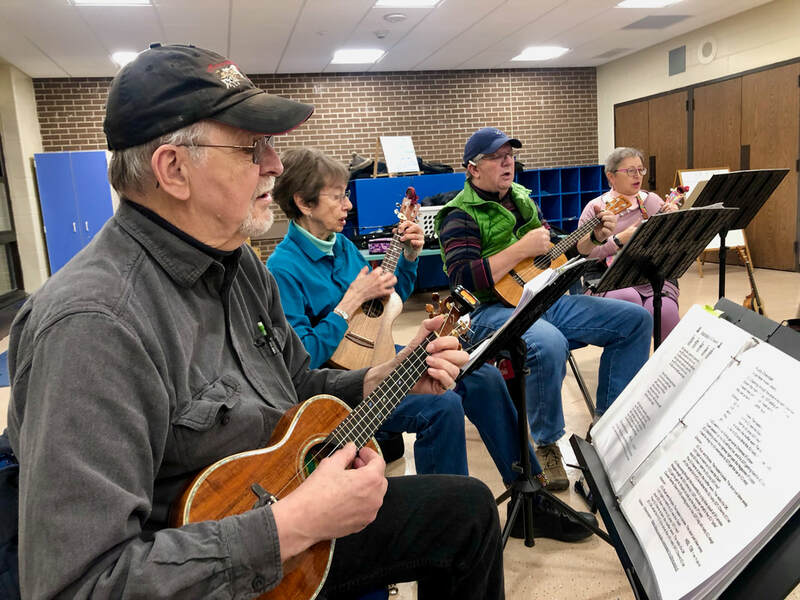 The Twin Cities Ukulele Club jams are sponsored by Minnesota Bluegrass and Old Time Music Association, but we play a broad variety of music styles with an emphasis on roots music - a tour of music from and for the people. Need help playing the uke? Twin Cities Ukulele Club Friday Morning jams start with a half hour basic workshop 30 minutes before the scheduled jam start time. This is for new uke players or those who haven’t played uke much or recently. The whole idea is to introduce and practice chords, chord changes, 1 4 5, and other concepts to new or less experienced uke players before the jam. The Twin Cities Ukulele Club holds MANY ukulele jams a month. We also occasionally perform at public events. For complete information - www.tcukeclub.com. 2nd and 4th Mondays - BUG - Bluegrass Ukulele Group - www.BluegrassUke.com. 1st and 3rd Wednesdays at Riff City Music - www.WednesdayJam.com. 1st and 3rd Thursdays - UkeAmericana - www.UkeAmericana.us. 2nd and 4th Thursdays as scheduled - BUZZ - Blues, Uke JaZZ and MPtB & Moving Past the Basics - group lessons - www.BUZZUke.us and www.MPtB.us - BUZZ and MPtB are for more advanced ukulele players, and there is an instructor fee. 1st and 3rd Fridays at Cadenza Music, St. Paul - www.UkeMorningJam.com. ​Questions - Automatic Notification of Events - You may sign up for automatic e-mail notification of Twin Cities Ukulele Club events or ask questions about the Twin Cities Ukulele Club by contacting twincitiesukeclub@icloud.com. Resources for BUG, Wednesday Noon Riff City, Friday Morning and UkeAmericana Jams - We routinely use songs and tunes from our BUG Song and Tune List and Favorite Old-Time American Songs for Ukulele at BUG, UkeAmericana and Friday jams. We use the Daily Ukulele: 365 Songs For Better Living Yellow Book at our UkeAmericana and Friday Morning jams. We use the Daily Ukulele: Leap Year Edition Blue Book at our Wednesday Riff City, UkeAmerican and Friday Morning jams. Songs on the BUG List are available for free download to those who attend Twin Cities Ukulele Club jams.